(CNN) For years Matthew and Maria Colonna-Emanuel thought a piece of rusty metal behind some trees in their backyard was just part of a cable or electrical box. The couple saw the metal box between some trees when they moved in to their Staten Island home in New York, but never paid much attention to it. “I thought it was an electrical box,” Matthew Colonna-Emanuel told CNN affiliate WCBS. When trees in their yard were damaged by wildlife they got a better view. “It [the box] was really prominent when the deer ate away all the foliage,” Matthew said. 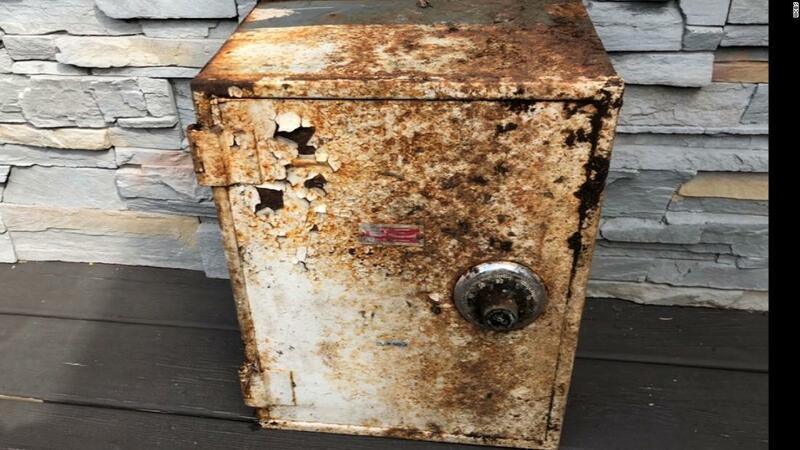 After digging it up they realized it was a rusty old safe. Inside they found wet money, and a lot of jewelry in plastic bags. “Hundreds, jewelry, diamonds, engagement ring. Dozens of rings, gold with jade. It was stunning,” said Matthew. There was also a piece of paper with an address — one of their neighbors. “First, I knocked on the door and I asked them if they were ever robbed and they said they were,” Matthew said. According to the New York Police Department, a burglary was reported at their neighbors’ home the day after Christmas in 2011. The only thing taken was the safe. It had a large amount of cash, jewelry and other items inside: a total of $52,000 worth of property, police said. “The cops told her, you’ll never see your stuff again,” said Matthew’s wife, Maria. But eight years later, thanks to the Colonna-Emanuels, she did. Matthew said their neighbor was shaking when he told her they had found her safe. “The reward is karma. Good karma.” added Matthew.